Whether you are looking for storage on your premises or in a warehouse, ADCO Van & Storage has you covered with two stress free options. We store furniture, business records, products, electronics and more. 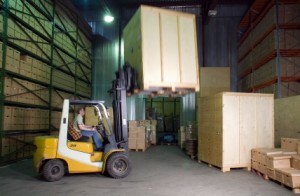 Palletized secure storage in our warehouse is available for short term or long term clients. Our storage is designed to keep fine furnishings well protected and in excellent condition. Contact us for a quote on storage. ADCO now offers DIY customers a portable storage and moving container solution. 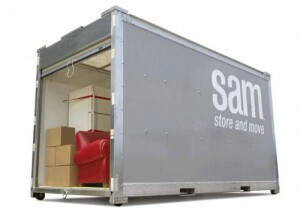 Whether you’re moving into a new home or just need some temporary storage space, a SAM container is the perfect answer. Convenient and easy to use, SAM containers keep the things you care about safe and secure. Weatherproof construction and rugged, steel framing keep items safe. Smooth walls help reduce possible nicks and scratches. Put a SAM container in your driveway today! Call 630-543-5146 or visit qrsmoving.com.